Step 1 Rinse the scallops and remove their tendons. Place them in a small glass bowl. Combine the lime and lemon juice with the olive oil, 1 teaspoon salt and the chile and pour over the scallops. Mix with a rubber spatula. Cover. Marinate 1 hour in the refrigerator, stirring occasionally. Step 2 Just before serving, seed and skin the avocado. Cut the flesh lengthwise to make 12 almost paper-thin slices. Arrange the slices to cover the center of each of 4 small serving plates, overlapping them very slightly. Season with salt and pepper to taste. Step 3Drain the scallops and cut each one crosswise into 3 slices. Arrange 12 slices attractively over the avocado on each plate. Dot each slice with caviar. Sprinkle the chives around the perimeter of each plate and serve at once. In Recipes-list.com we have selected the most viewed recipes from category - Appetizers Fish and shellfish . Enjoy the best recipes specially selected for you! 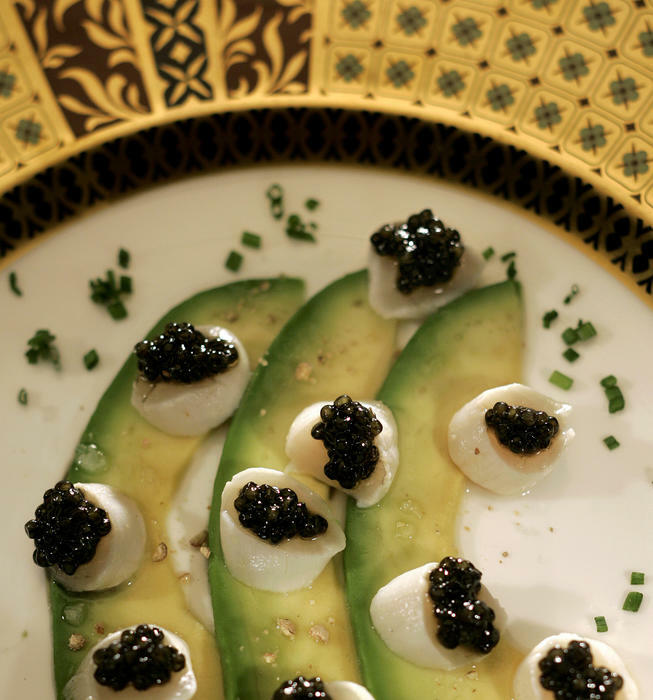 Scallop ceviche with caviar is the right choice that will satisfy all your claims.